And the first review is in on Amazon: 5/5 stars! Not just a quote book. 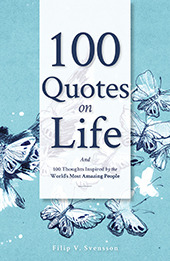 With 100 amazing quotes and the motivating reflections of the author (which have received over 100 000 likes on Instagram) this is a quote book like no other – and the perfect companion through life. Get it now on Kindle or try the very nice paperback version!